Experience Portugal at a relaxed pace while taking in the important cities of Lisbon and Oporto—typical towns and villages and the stunning north-west coastline. Throughout this tour, you’ll visit the must-see attractions, including the 16th-century Jeronimos Monastery. Often regarded as Lisbon’s most important landmark, it was traditional for Portuguese seafarers to pray in the chapel before their departure to the unknown. You’ll visit the Sanctuary of our Lady of the Rosary in Fátima, a pilgrimage site where apparitions of the Virgin Mary were reported by three local children in 1917; the 700-year-old university in Coimbra; the Arabian Hall in the Stock Exchange in Oporto, and the Ossuary Chapel in Evora, with its bone- and skull-covered walls. For this exceptional escorted tour of Portugal, Globus has arranged some special treats so that you can savor Portuguese cuisine and wine. Enjoy a port wine tasting at one of the local wine cellars in Oporto, an olive oil tasting in Belmonte (birthplace of Pedro Alvares Cabral, discoverer of Brazil), and tapas with wine at the Quinta da Aveleda winery. 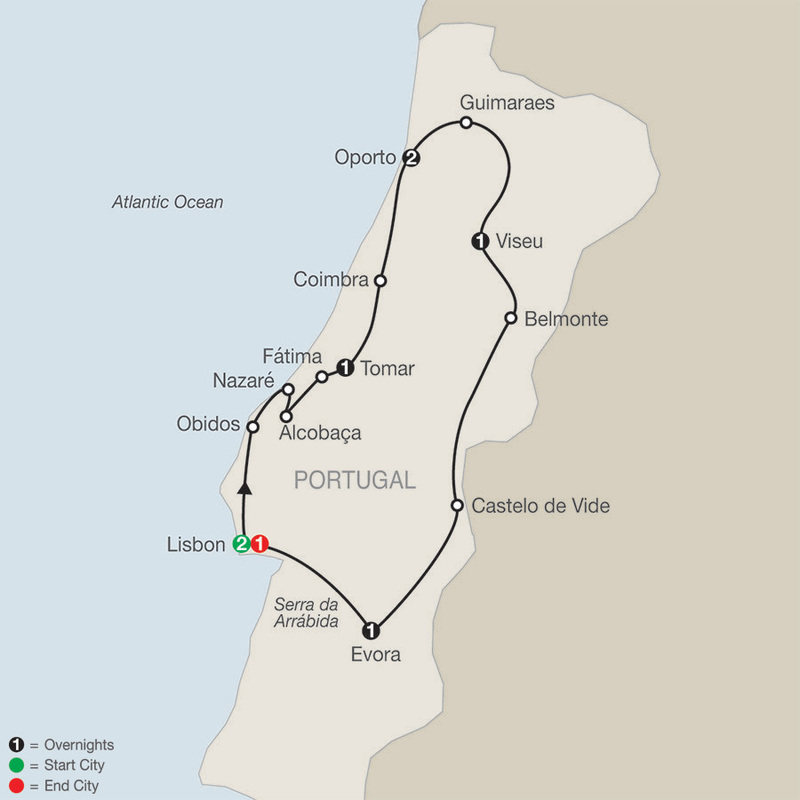 All of this and much more awaits you on this wonderful Portuguese Escape! DAY 1 ARRIVE IN LISBON, PORTUGAL. DAY 7 VISEU–BELMONTE–CASTELO DE VIDE–EVORA. Hotels listed may occasionally be substituted with alternate hotels of equivalent standard. This modern 249-room mid-scale hotel offers Free Wi-Fi access throughout and has a seasonal outdoor swimming pool with sun terrace and poolside bar. There is a small fitness center, a cool vintage style restaurant and bar serving International cuisine as well as a buffet style restaurant. A 104-room modern hotel offering Free Wi-Fi Internet access and year-round heated rooftop swimming pool, with panoramic views over the Águas Livres Aqueduct. International cuisine and Regional wines can be enjoyed in the main restaurant and there is a lobby bar serving a wide range of drinks & cocktails. Contemporary 4-Story Hotel in picturesque central location overlooking River Nabao. Located in the heart of UNESCO's World Heritage Historical City Center, this beautiful 107 room hotel is housed in a renovated 18th century palace overlooking the breathtaking Batalha Square. The cozy Gastrô Bar and restaurant serves modern dishes inspired by regional cuisine and has an outdoor terrace. Free Wi-Fi internet access is available throughout the property and there is also a gym and wellness center with indoor hydrotherapy pool, sauna, steam room and Jacuzzi. A modern 212-room high rise hotel near the historical Porto city centre with a chic atrium bar and culinary concept restaurant serving traditinal Portuguese cuisine. Amenities include a gym, spa and Free Wi-Fi access is available throughout. Low-rise Hotel surrounded by gardens & a park in the heart of town. This surprising hotel offers 85 double rooms and the restaurant "Sabores do Alentejo" where one can taste the local gastronomy under the signature of Chef António Nobre.